Five for Friday: Slant Box, Cold Weather, & a New Book! 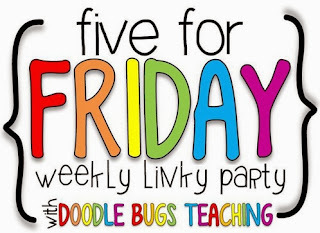 Today I'm linking up with Doodle Bugs Teaching for my last week of the trimester recap! It's been a very crazy week because it's the end of the trimester which means grades are uploaded on Monday... So, of course I still have a few things left in my teacher bag to finish up. Such is the life of a procrastinator.... But, in the meantime, here's a peek at my life this past week. 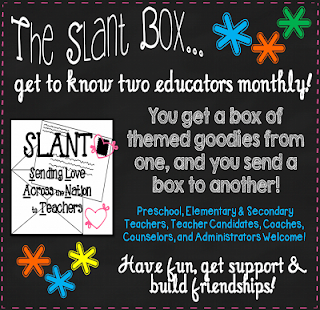 I got my #SlantBox this week and of course it was amazing! Thank so much to Lauren at The Traveling Teacher for putting together an extremely amazing box! She really made education less "scary" by all her treasures :) Plus, she made my box more Thanksgiving themed since it's my favorite holiday! I love all my fall goodies and can't thank her enough! It was also great getting to know Kim from Mrs. H's Resource Room whom I sent my box to! We had our first snow fall this week! Driving into work was beautiful as the dusting covered all the ground and trees. Just a dusting is all I need - I hate driving in "inches" of snow! With the cold weather brought out my need to feel warm and cozy! My newest addiction and discovery is McDonald's White Chocolate Mocha! OMG! This is delicious coffee at it's best! I'm so excited for this new flavor. I also helped Iggy get warm and cozy by purchasing him a fleece hat from Target. Found a new historical fiction novel that I might try to incorporate into our unit. It's Cincinnati Public Library's juvenile book of the month. So it has to be good right? The library usually doesn't disappoint. The book is about slavery after The Emancipation Proclamation. I can't wait to start reading it over Thanksgiving Break! The book is called Crow by Barbara Wright. We're cruising through our regions of the United States! We're wrapping up the Southeast this week and going to start the Midwest by Friday! We're a little behind schedule on the calendar but the students hare having a great time creating scrapbooks and mementos of our cross country travels! Our word wall has been one of my favorite parts of the unit. Students have done a stellar job and I love seeing all their work hanging up on the walls as we go through our regions! Click here to grab a copy of my Midwest words and Midwest word wall worksheet. *Our words align with the Social Studies Alive text series. Mickey D's White Chocolate Mocha...I will need to try that. The Mickey D's by school is in some major renovation mode and I can't ever tell if they are open or not. Love the Target hat! Super cute! I love how interactive your word wall is. I taught regions when I taught 3rd grade and loved every minute of it. Fun facts to know and the kids are always interested. Great job on education credit information, which surely everyone was happy with. All the details was fun but useful at the same time. Girl Games | Kizi 2 | Minecraft Thanks for keeping us interested!